Is It Normal to Feel Anxious During Pregnancy? Are You Abnormally Anxious During Pregnancy? Are you experiencing anxiety with your pregnancy? Are you concerned your worries might not be normal? Every expectant mom has her fair share of worries — you would be crazy not to. Your body is enduring so many changes to support a whole other life inside of you, and your emotional state is probably a rollercoaster. You may be worried your anxiety is negatively affecting your baby, and this could be true. It’s important to figure out what a normal level of anxiety is and what you can do to try to feel even a little less anxious. Is Anxiety A Symptom Of Early Pregnancy? What Kind Of Anxiety Is Considered Normal? Can Anxiety Affect Your Pregnancy? Can Pregnancy Cause Anxiety To Worsen? Some women believe increased anxiety is an early indication of pregnancy. This could be true, although there is not enough evidence to positively correlate the two. Anxiety can arise for many different reasons, and a new pregnancy may not be the culprit. You could experience increased anxiety if you have missed a period. This does not immediately mean you are pregnant, but some women tend to become anxious while awaiting confirmation. It is likely that a mother who just found out she is pregnant may experience heightened anxiety. Pregnancy can bring about many different emotions ranging anywhere from pure joy to fear. It only makes sense there will be some anxiousness (source). Even the most prepared women will experience some anxiety when finding out they are pregnant. If you didn’t experience some anxiety throughout your pregnancy, you wouldn’t be human! There are so many worries that come with pregnancy. What if I won’t be a good parent? What if something is wrong with my baby? Can I handle the financial responsibilities of a baby? How will I handle my job while being pregnant? How will my partner feel about this pregnancy? All these concerns about your pregnancy are considered normal worrying. You are embarking on a life-changing journey, so give yourself a little credit for all your second-guessing. If your worrying consumes you and your everyday life, then you are probably experiencing extreme anxiety. That should be a cause for concern. It’s important for you to stay on top of your pregnancy and your symptoms, but try not to compare your pregnancy and symptoms to that of someone else. Each pregnancy is different and unique. Some mothers tend to experience something in their pregnancy and then Google it to find out more information. Google can be resourceful, but it can also increase your anxiety. A quick search can quickly lead you to believe you are suffering from something far worse than what you are in actuality. If you believe you are experiencing a severe symptom, call your doctor. It’s sometimes hard to differentiate between what is just a typical worry, and what is anxiety induced. It is completely normal to worry, but if you experience some of the following symptoms, you may have anxiety (source). Excessive worrying about many things, including your baby. Unable to focus or concentrate on day-to-day tasks. Frequent sense of panic or fear. You no longer enjoy things you used to love. Don’t try to downplay your anxiety symptoms. This kind of anxiety is not healthy and can be helped with treatment. Don’t force yourself to suffer because of embarrassment — so many other moms have ventured down the same road as you. Ignoring your anxiety symptoms can cause them to heighten because you will find yourself going out of your way to mask your symptoms from others. Anyone is at risk of developing anxiety during pregnancy. About 52 percent of moms reported increased anxiety or depression when pregnant (source). It’s hard to determine what exactly can put you in a high-risk category for experiencing anxiety while pregnant, but some of the following can increase your potential to feel anxious. Loss of a previous pregnancy. Previous diagnosis of an anxiety-related issue. Anxiety is a normal and accepted part of pregnancy. But there is a point where the level of anxiety you are experiencing may not be so normal anymore. High levels of anxiety can cause long-term problems for your growing baby. There have been numerous studies conducted that link high levels of anxiety in moms to children with ADHD (source). This does not mean if you are anxious your child will have ADHD. This means that above average levels of anxiety have been known to increase the chances your child will develop ADHD significantly. There has been other research conducted linking high levels of anxiety to delayed infant development, poor academic performance, and social and emotional issues (source). Anxiety has also been known to cause low birth weight, preeclampsia, and preterm labor (source). Why Should You Seek Help? Many mothers believe their symptoms will go away once their baby is born. Delivering a healthy baby can decrease your anxiety, but you might not be home free. Mothers who have severe anxiety during their pregnancy often experience more extreme episodes of postpartum depression. This can cause many difficulties in your new life with your newborn, and also makes it extremely difficult for you to bond with your baby. If you allow your anxiety to go untreated, it can cause many other issues to arise. Lack of bonding with your baby. The most important thing to remember is that extreme anxiety can cause issues for you and your baby. It is in your best interest to consult your doctor if you have the slightest concern you may be suffering from anxiety. Pregnancy brings about many new changes in your body and many new worries. Some women may actually see a decrease in their anxiety symptoms once becoming pregnant (source). Your hormones are in full effect when you are pregnant, and you have little control over how they are going to affect you. You may notice your anxiety decrease significantly, or your pregnancy can cause it to become worse. Creating life is no easy task, so it should come as little surprise that the journey to motherhood could leave you feeling anxious. About 10 percent of pregnant women will experience an anxiety attack during their pregnancy. These can be dangerous for you and your baby, so it’s important you understand the signs and symptoms associated with one (source). Muscle weakness, especially in the legs. An anxiety attack will cause your anxiety symptoms to dramatically worsen, usually rather quickly. An attack can last anywhere from seconds to minutes. If you think you may have experienced an anxiety attack, it is crucial to contact your doctor as soon as possible. If your anxiety is at such a high point that it is dangerously affecting you and your baby, a doctor may prescribe you medication. Most anti-anxiety drugs are categorized as antidepressants, so they are generally not safe for pregnancy. A doctor would not prescribe this medication without taking into account the risks and benefits associated with it. If the benefits associated with the prescribed medication outweigh the potential risks that it could cause your baby, then your doctor may go ahead and prescribe it. This is usually a very rare circumstance. If you were taking anxiety medication before you got pregnant, speak with your doctor about whether you should continue to use it. Some doctors recommend you keep up with your medication. If you aren’t in a position where you think you need an anti-anxiety medication, but you still need some relief, you aren’t out of options. While there is no immediate and permanent cure, there are ways to lessen the anxiety you feel (source). Get More Sleep: Try to get more sleep than you are getting. Your lack of sleep could be amplifying your anxiety symptoms. Exercise: Just a few minutes of exercise a day can reduce tension and relieve anxiety symptoms. Have A Support System: No matter your situation, make sure you have people around you who support you and have your best interest at heart. You could consider joining a support group or online community to connect with other women who may be experiencing or have experienced the same journey as you. Properly Prepare: If you get ahead of the game and prepare yourself as much as you can for the arrival of your child, you may reduce your anxiety. If you are super stressed about the thought of childbirth, take a class at your local hospital to help ease your mind. Relax: Make time for yourself to relax. You can participate in yoga or maybe even splurge on a prenatal massage. You deserve the extra pampering. Acupuncture: This has been known to help relieve tension and improve your mood. Both of these can combine to help reduce your anxiety. Communicate: Express your feelings and worries with someone. Don’t keep everything on the inside or else you are going to work yourself up so much that you could reach a breaking point. Avoid Triggers: Some people’s anxiety seems to be triggered by specific people, places, events, or even foods. If you can directly relate your increased anxiety to something else, try to avoid it. Eliminate Caffeine: If your diet still contains caffeine, try to eliminate it or cut back. Caffeine contains stimulants that can amplify anxiety symptoms. Eat Healthily: A well-balanced diet alone can help reduce anxiety symptoms. Meditate: Focusing on your breathing and clearing your head can naturally help calm you down. This may take practice, but it can be successful. It may take time to find something that can help relieve your anxiety, but there is a solution out there. If nothing seems to work, talk to your doctor about your options. You never have to struggle alone — there are so many people waiting with open arms to help. 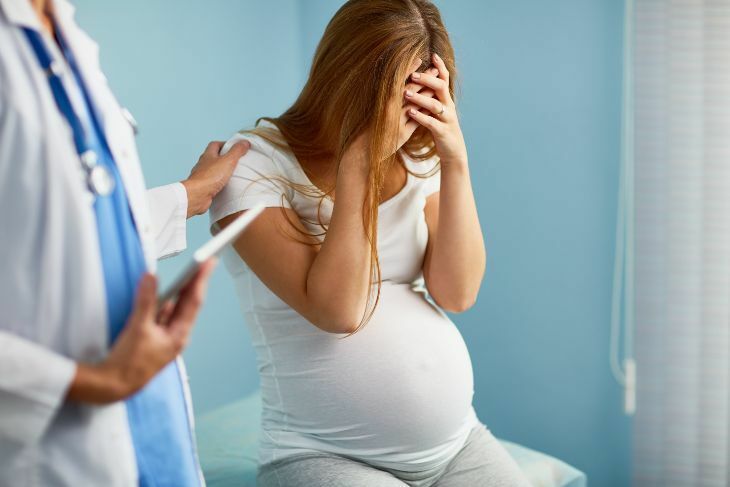 While you may not wish to seek treatment for anxiety in pregnancy, don’t forget that there is always psychotherapy or counseling, which can provide drug-free relief in just a few sessions. Anxiety is an ordinary part of pregnancy, but there is a point where a high level of anxiety is no longer normal. If you believe you may be experiencing extreme anxiety, then you should reach out to your doctor for help. If you allow your anxiety to go untreated, it can cause far more damage. You don’t have to suffer in silence — there are so many people who are willing to help you relieve your symptoms. Just remember, pregnancy is a rewarding, but challenging, journey. There is no shame if you are struggling to push through your journey. You may think you are superwoman, but even superheroes need sidekicks. Feel free to leave your opinions regarding this topic in the comment section below. If you enjoyed this article and thought it was helpful, please give it a share! Why Are Amniotic Fluid Levels in Pregnancy So Important? What Does Lightning Crotch Mean For My Pregnancy? Can the Stomach Flu Hurt My Pregnancy?